Just because there’s no water doesn’t mean it’s not fish habitat! Temporary streams provide spawning habitat for river fishes. Picture a beautiful flowing stream, teeming with life and sparkling in the sunlight. Now, imagine that in a matter of days it has all disappeared, evaporated into the air and carried off with the wind. In places where it is warm and dry for most of the year, this phenomenon is more common than one might expect. Scientists call these types of streams intermittent or ephemeral streams (Figure 1), and they are beginning to discover just how important these rivers really are to the fish that live nearby. Figure 1. The Cavalon River, an example of an intermittent river in its wet phase (left) and dry phase (right). Photo: Bertrand Launay www.phys.org. A new study led by researchers at the Colorado Parks and Wildlife Aquatic Research Section found that intermittent rivers are actually important to the life cycles of many freshwater fish species. The research team looked at the use of Cottonwood Creek, an intermittent tributary of the Gunnison River in Colorado, by spawning Flannelmouth Suckers (Catastomus latipinnis; Figure 2a), Rondtail Chubs (Gila robusta; Figure 2b), and Bluehead Suckers (C. discobolus; Figure 2c). They studied the river from 2015 to 2017 using a combination of weirs and PIT tagging (Passive Integrated Transponder, a common method of tracking fish movements through the use of radio frequencies) to capture and track the movement of the spawning fish. Figure 2. 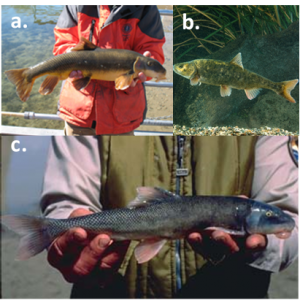 A Flannelmouth Cucker (a; photo: www.lcrmscp.gov), Roundtail Chub (b; photo: www.usgs.gov), and a Bluehead Sucker(c; photo: www.dwrdcdc.nr.utah.gov). They discovered that high numbers of Suckers were using Cottonwood Creek each year to spawn. Despite the river only being present part of the year, and in some years the river had more water in it than in other years, many fish would lay their eggs in the river each year in hopes that they would hatch in time for the larvae to find their way into the perennially flowing Gunnison River. 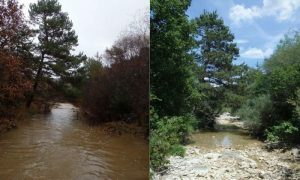 They even discovered that high percentages (around 61 to 71%) of tagged fish returned to Cottonwood Creek in subsequent years, indicating that their migrations up the intermittent stream are not just one-off events. This study highlights the overlooked importance of these temporary habitats to the life cycles of freshwater fish. So overlooked in fact, that there is continual debate over whether they should be included under any legal definition for regulatory protections, such as the Clean Water Act (CWA) of the United States. As recently as 2018, proposals to drop non-permanent water bodies from the definition of ‘Waters of the United States’ under the CWA have been proposed, which would eliminate protections for ephemeral and intermittent streams and some wetlands if it becomes law. However, this study shows that we still have a long way to go to understand the true value of ephemeral and intermittent streams to fish populations.